The Keller family, Ava, Rachel and Lydia visit Lisa Bailey’s classroom. Second grade teachers at Fairley Elementary School recently opened their classrooms after-hours for parents and their children for a Zoo Night. Each classroom represented a different habitat. The pond room housed baby ducks and information on both animal and plant life. 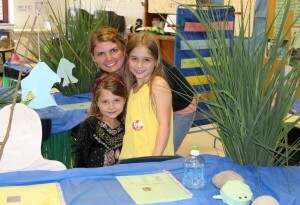 Prior to the event, each second grade student researched a habitat and wrote a report about their findings. 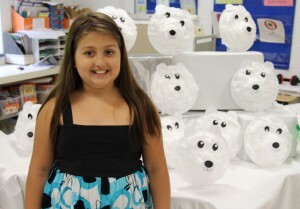 Second grade student Aislinn Osborn learns about polar regions at Fairley Elementary’s Zoo Night. The classroom was transformed into an arctic tundra and featured students’ artwork, like the polar bears seen here.